Read here about tensegrity structures composed of four struts, part of a series of pages organized by strut count. Four struts forms one of the most basic and popular tensegrity forms. SMiA uploaded a video showing the final construction step of a 4 strut tensegrity prism wrapped in a continuous elastic-fabric membrane. A basic 4 strut tensegrity is constructed as a prism. Each strut rises from a "base" tension filament to an "apex". The result outlines the form of an antiprism. 4 strut series, with varying strut and tendon lengths. Construction and photo by Marcelo Pars. A four-strut tensegrity prism is available in the [online 3D simulation java applicaiton]. In the object selection box on left, select "four struts." Other online applications are added all the time, see Online Applications page. 4 strut nucleus of an outdoor display unit. The blue tension members are shown at strut ends, but they are implemented mid-strut. Design and rendering by Raffi Tomassian. 4 strut structural cell of an outdoor display unit. Not the tension members connect mid-strut. Design and rendering by Raffi Tomassian. 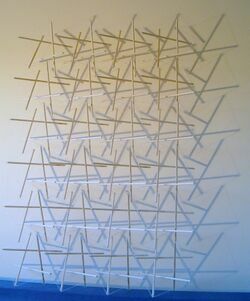 Marcelo Pars built a http://www.tensegriteit.nl/demuur.html%7Ctensegrity wall by repeating the 4 strut element 24 times, yielding 96 struts and 364 tendons. It took him approximately four days to build and cost about 40 euro. Reported to the geodesic list 13 Feb 2010. 4x24 strut wall by Marcelo Pars. Motro worked with freeform tensegrity structures. In this approach, no topology of the whole system is specified in advance for that example. The process is started from a simple system and, next, more and more struts and cables are added step by step. Below, a progressive series of tensegrity structures that is developed freeform from 4 struts, to 5 struts, to 6 struts. The first figure on the right is a 4 strut tensegrity structure. To this Motro added a vertical strut 9-10. To keep nodes 9 and 10 in equilibrium state, making a 5 strut structure. To stabilize it, 6 tension members are added, 3 to each node of the added strut. The 5 strut in the center is then developed into the 6 strut on the right, followed by the 7 and 8 strut structures in the following diagram. The 8 strut in the center has 36 tension members. On the right, 3 tension members have been removed. Freeform tensegrity structures, progressing from 4 struts to 5 struts and 6 struts. From Structural Morphology Of Tensegrity Systems by Motro. Freeform tensegrity structures, progressing from 7 to 8 struts. The 7 strut is on the left. The 8 strut in the center has 36 tension members. On the right, 3 tension members have been removed. From Structural Morphology Of Tensegrity Systems by Motro. This paragraph is repeated on the 5 struts page. This page was last edited on 23 September 2018, at 12:51.